RALEIGH, N.C. - The chance was there and it couldn't have been bigger. The Flyers had come back after falling behind by two in the first period to tie the game in the third on a hustle play from a young defenseman who was caught up in his team's gathering energy. Alexandre Picard swooped in from the blue line and got to a loose puck at the side of the net and lifted a shot over Carolina Hurricanes goalie John Grahame to tie the game with 4 minutes to play. And then, after two losses (one at home, one on the road), injuries and a big trade, it was all there for the taking in overtime. With Rod Brind'Amour off for tripping, the Flyers had the momentum and a four-on-three power play. But in a moment of confusion, two forwards were caught up ice and a defenseman who hadn't scored a goal all season got down to the net ahead of everyone else. He scored the game-winner for the Hurricanes on a spin pass from Justin Williams. 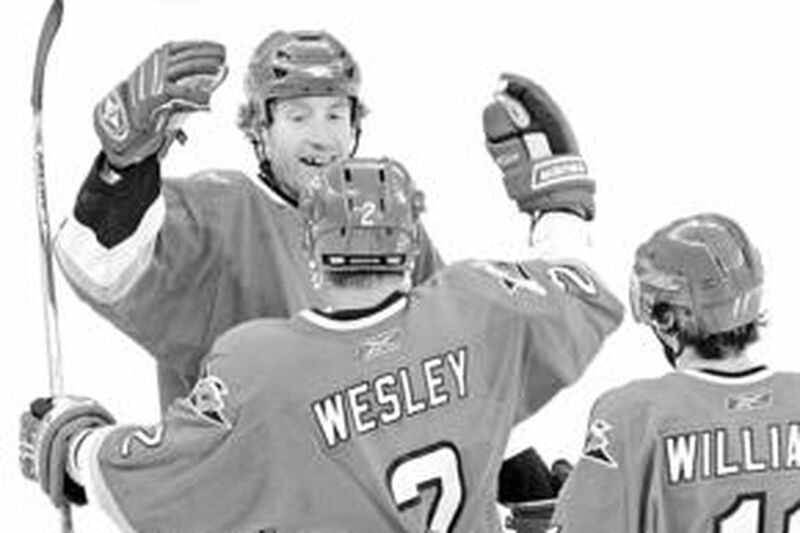 And just like that, Glen Wesley's overtime goal changed what could have been a huge lift for a team in need of a boost into a 3-2 loss at RBC Center last night. "To have a chance to win it at the end is heartbreaking," Derian Hatcher said. "We could have won this. We weren't happy after the first period. For the first 10 minutes we played pretty well and we let them take the momentum from us. "But overall we can't say it was a bad effort. It's unfortunate, but I can't say it was a bad effort." But it was a missed opportunity in a season in which opportunities don't come easy. "When you get a four-on-three in overtime, it really favors you," coach John Stevens said. "We just relaxed for a minute and a veteran guy took advantage. "It's disappointing because we had to be ready there. We had the puck, we kind of lost control and then we got beat up the ice. I was certainly happy the way we battled back from 2-0 on the road, but we have to start finding ways to take advantage of these opportunities." The Flyers had a decent start and outshot the Hurricanes, 9-3, until Brind'Amour scored Carolina's first goal on a shot that looked as if it would go wide. Antero Niittymaki stuck his hand up, the puck hit his glove and was redirected in. Niittymaki stood and looked into his hand as if there were a hole in the glove. "I just overreacted a little bit," Niittymaki said. "It wasn't as hard as I thought it was going to be. It wasn't the glove or anything like that." The Flyers played deflated from that point, didn't get another shot on net in the period and gave up the second goal during a battle out front. Randy Jones was searching for the puck in a tight scrum but Andrew Ladd knew where it was and pushed it past Niittymaki, putting Carolina up, 2-0. Carolina continued to dominate in the second, but Dmitry Afanasenkov kept the Flyers in the game. After taking a long pass up ice from Jones, Afanasenkov skated to the top of the circle and took a slap shot that found the inside of the post over Grahame's shoulder. "I was driving to the net and was even with the defenseman and just stopped and took the shot," Afanasenkov said. "I saw the side was open and I just shot it and got lucky." The Flyers continued pressing until Mike Richards bulled his way to the net with the puck and pulled Grahame to the side before losing control. It was enough to give Picard the chance to tie the game. "[Richards] made a nice play and took the goalie across," Picard said. "I don't know if he touched the goalie or not, but the puck was just laying there and I put it into an empty net." It was a moment of elation followed by another loss.